Kansas, as big as you think! Kansas, the Sunflower State is the fifteenth largest state by total area, and it is the 34th most populous state with just over 2,104,509 people as of 2016. This city is known for its agricultural industry and its wide open spaces. The state of Kansas has a rich history, and the land was once occupied by several different Native American tribes. Kansas has experienced several rapid population growth spurts with people drawn to the rich lands and various living spaces including cities, suburbs, and rural areas. Kansas embodies friendly and open people, and this brings people in each year. Additionally, there are several notable sporting events and teams and higher education opportunities that draw a strong college-aged population in. The seemingly endless views and large suburbs are also an embodiment of this area. If you're looking for a state with a strong arts scene, Kansas is it. There are dozens of events and a strong economy that draws hundreds of people to the state each year. Additionally, the cost of living is over 9% below the national average, and the housing market is strong. When you combine this with the varied job market, you have an irresistible place for people to start their lives. People move out of Kansas because the area has a very competitive job market for niche jobs, and several newly graduated individuals may not want to wait to find employment. Additionally, the urban sprawl may turn people away who want to experience the bigger cities in the United States, and retirees are leaving the state as well. Kansas is currently ranked as the sixth worst state in the nation for its residents moving to other states. The demographic that seems to find Kansas an ideal state to live in are people in their mid-30s to early 40s who are securely established in their careers. The suburbs provide ample housing opportunities, and a lot of them won't have to commute far to get to their jobs. Currently, Kansas's housing market is higher than it was before the housing market crash. The market rose until the start of 2007 when a slight peak trailed off into a drop. This drop quickly recovered to another peak in 2008, only to drop off once again to a slightly lower drop in mid-2009. This trend of gains and losses continued until the housing market hit its lowest point in the middle of 2011. Once the housing market hit its lowest point, it began to climb again only to drop off and rise. The end of 2011 saw yet another peak that dipped down slightly before continuing its rise. From 2012 to 2014, the market struggled to stabilize itself, and it managed to gain traction. Kansas saw it's housing market begin a steep climb once again that lasted until the first part of 2016 when it leveled off. It dropped again in early 2017, but it recovered quickly and it still climbing at a steady pace. Wichita saw housing market trends that were similar to the state as a whole except for a few key points. Wichita’s housing market started to have trouble around the middle or 2006, and residents saw a drop that the market had trouble recovering fully from before the housing market crashed. Early 2008 saw Wichita’s highest point, and by the end of the year, the market had started to fall. However, this was a rocky descent, and Wichita’s housing market didn't hit their lowest point until 2012. It slowly started to recover, but the market fell again in 2014. Once it fell again, it had a steady incline until the end of 2016 and the start of 2017 when housing prices abruptly dropped. They recovered quickly, and they've been quickly rising since the last drop, and they're now higher than there were before the housing market crash. In 1991, the state of Kansas began to experience a steep incline in the statewide housing market. This incline continued until 1994 when the market saw a slight peak that quickly leveled off. This trend continued until 1997 when the housing market really took off. This rapid climb continued through the early 2000s until 2003 when it saw a very slight dip. Once the housing market hit this slight dip, it went right back up again, and it continued on this track until it hit its peak before the housing market began to fall. Wichita had a much rougher historical real estate market from a historical perspective. In 1991, the market started with a slight drop that set the trend for the next few years. The housing market would rise and fall until 1997. In 1997 the housing market started to climb steadily with a few very small drops and gains, and it kept this steady growth going until 2005. In 2004, Wichita had its first significant drop and this continued until it plateaued out in 2006. It continued to gain and lose until it hit its peak in 2008. The statewide homeownership rate rose from 66.5% in 1997 to 70.4% in 2001. Kansas did not participate in the housing bubble the way states like Arizona, California, Florida and Nevada did. Thus homeownership rates did not jump during the housing bubble. The rate of homeownership did begin to slide before the onset of the recession, with the rate falling from 70% in 2006 to 68.8% in 2008. Ownership bottomed in 2012 at 63.2% before jumping back to 67.1% in 2016. Kansas is home to several influential cities, and these cities have large cultural diversities. This draws people of all different backgrounds to the state year round. 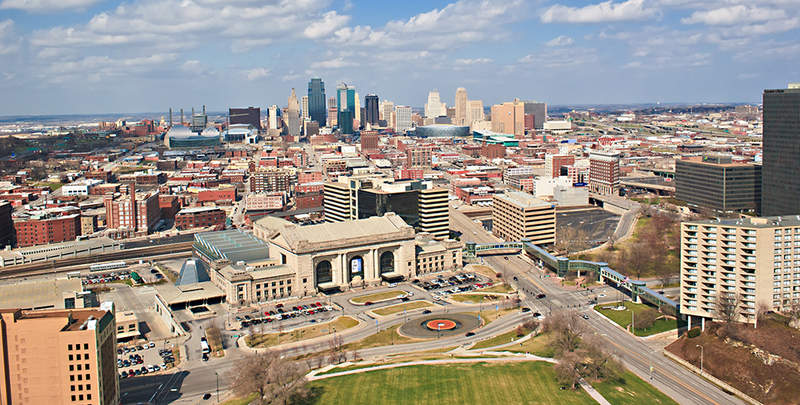 The largest cities in Kansas are Wichita, Overland Park, Kansas City, Olathe, Topeka, and Lawrence. Wichita is the largest city in the state of Kansas, and it has a population of 389,902 people as of 2016. Wichita is also part of the greater Wichita Metropolitan area, and the combined population of this area and Wichita itself is 644,610 people as of 2016. This city is an industrial hub for Kansas, and it is the center for several prominent cultural events, media, and trade. The biggest economic support is the industrial sector with manufacturing making up over 20% of this city's economy. There are also several leading healthcare facilities located throughout the city, and the business district is also a large influence. Two of the largest private companies in the nation is headquartered in Wichita. Aircraft manufacturing and education round out the top economic support pillars. Wichita lies right on the fringes of the humid subtropical climate zone. This means the city experiences hot and humid summer months with cold and dry winter months. January is typically the coldest month for this city with temperatures staying around the high-20s. July is the hottest month with temperatures sitting in the upper 80s, and June has the most rainfall. As there are wide open spaces all over the state and the city as a whole, Wichita routinely experiences severe weather year round. The spring and summer months typically see severe thunderstorms with large hail and lightning strikes. Tornadic activity is also a commonplace. Kansas also sees snowfall on average of ten days per year with freezing temperatures falling between the end of October through the start of April. Wichita is known for being a cultural center for the state of Kansas, and there are several museums, concerts, and groups for the performing arts located here. There are also several festivals held throughout the year to enjoy. The Wichita Art Museum is the biggest in the state of Kansas, and it houses over 7,000 art collections and works. You can also enjoy the world-renowned Music Theater Wichita, or take in the Wichita Riverfest. This city is home to the largest school district in Kansas, and the Wichita Public School District has over 50,000 students enrolled. There are more than 90 schools total in this school district, and they range from charter schools and special programs to ordinary schools. The Wichita State University has over 15,000 students and it's the third-largest higher education school in the state. Newman University is a Catholic college, and there are several technical and satellite schools including the University of Kansas School of Medicine and the Butler Community College. The largest employer in Wichita is a manufacturing company named Cessna Aircraft, and it currently employs over 11,200 people. The second-largest employer is also in the manufacturing industry, and Spirit AeroSystems employs 10,900 people year round. Hawker Beechcraft and the Wichita Public School District round out the top three and four largest employers with 6,760 and 6,500 employees respectively. The economy is strong in Wichita, and there are more jobs being added each year. However, the large population is currently competing for these jobs, so the unemployment rate matches the national average. The past year showed a job rate growth of over 1%, and over the next ten years, jobs are projected to grow another 37% which should help to lower the unemployment rate. Wichita's median home price is hovering right around $120,000, and this represents a 3% increase in the past year. The average price per square foot is $103, and both of these figures are projected to rise 2.6%. The Wichita Metro area's median home price is currently at $154,900 with a price per square foot of $105. These prices have gone up 1.4% in the past year, and they're supposed to go up another 2.3% in the coming year. The second-largest city in the state of Kansas is Overland Park with a population of 188,966 as of the 2016 census. It is also a part of the Kansas Metropolitan area, and the total population of this metro area is 2,104,509 people. Additionally, Overland Park is located in Johnson County. Overland Park has a diverse economy with several large industries working side by side to support the local economy. Healthcare, retail, insurance and finance, information technology, and technical services make up the five largest sectors. You'll also find a few larger companies' headquarters scattered around Overland Park. The people in this city are known to be hardworking and dedicated, and this reflects back in the strength of the economy. This city is sitting between two different climate zones. One climate zone is the humid subtropical climate, and the other is the humid continental climate zones. 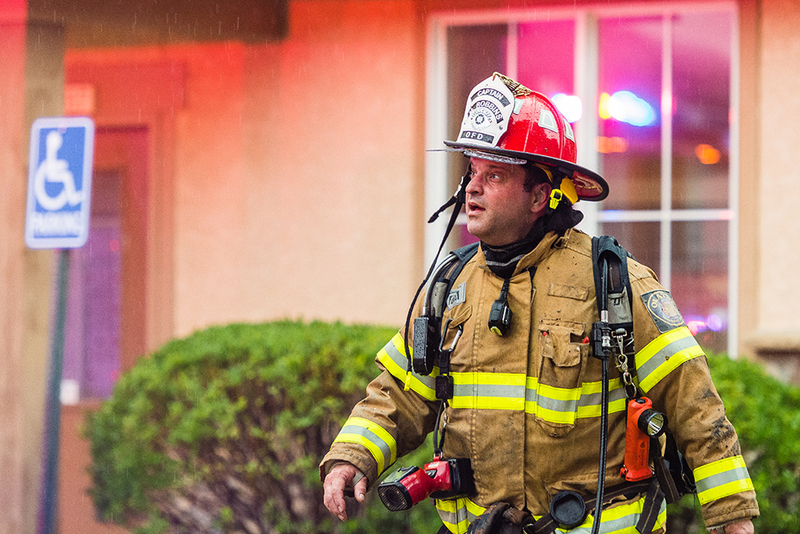 Overland Park typically experiences very hot, humid summer months and cold, dry winter months. December through January are the coldest months on average with the temperature ranging from the high 30s to the low 40s. June through September brings the hottest months of the year with temperatures in the mid to upper 80s. The residents and visitors of this city have several attractions they can enjoy year round, and they range from performances, museums, and parks. 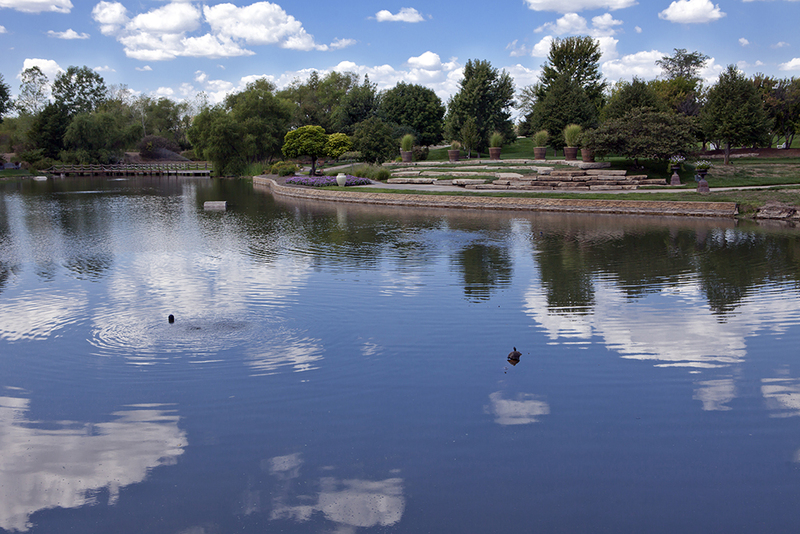 The Overland Park Arboretum and Botanical Gardens sprawls over 300 acres and have hundreds of different plant and flower species. You can also enjoy the Oak Park Mall, or take a walk through the Nerman Museum of Contemporary Art. If you like historical sites and farmers markets, visit the historic Downtown Overland Park. There are four large public schools systems in Overland Park along with twelve private schools. The largest public school is the Shawnee Mission School District, and it has over 27,000 students enrolled. You'll also find several colleges and universities around the city. Students can attend the University of Kansas-Edwards Campus or Emporia State University. The Cleveland Chiropractic College is also located in this city. If you come to this city looking for work, there are several large companies to choose from. The largest employer in Overland Park is Sprint, which employs over 6,200 people at their headquarters. The second-largest employer is the Shawnee Mission School District with 3,970 staff members. The third-largest employer is the Blue Valley School District, and there are currently around 3,313 employees. Overland Park's economy is very stable. The unemployment rate is below the national average, and there has been recent growth in the job market by over 1%. On top of this, job growth is predicted to rise by almost 40% in the next ten years. This city has been ranked as one of the best cities to start a business in the nation as well. The median local home prices in Overland Park are right around $273,500 and this is an increase of over 6.7% in the past year. The price per square foot is currently around $157, and this is also an increase. The prices are projected to increase by another 3.5% in the coming year. The Kansas City Metro area's median local home price is $225,000 with a price per square foot of $129. Kansas City is the third-largest city in the state of Kansas with a population of 151,709 people as of 2016. This population makes it the third-largest city in the Kansas City Metro area as well. This city is the county seat of Wyandotte County, and it also a part of a consolidated city-county government that is called a Unified Government. The city's economy has experienced several small increases over the years, and there are a few larger companies that have their headquarters here. Healthcare and education are two other large contributors to the local economy, and the lower cost of living helps to drive people to the area. There is also a large entertainment industry in the downtown district that has tourist events year round. Kansas City has a humid continental climate with four distinct seasons that receives various forms of precipitation year round. Normally, the summer months are hot, but they can change to very hot and humid, and July is the warmest month with temperatures ranging in the low 80s. Winters are cold and dry, and the coldest month is usually January with temperatures ranging in the low 30s. Kansas City sits on the edge of Tornado Alley, and severe weather in the spring and summer months aren’t uncommon. Residents have also experienced several ice storms over the years along with periodic flooding. There are several buildings listed on the Historic Register, and you can find them all over the city. The Rosedale Arch is a monument that is dedicated to the people from Kansas City who served in WWI. The Granada Theater is another place where residents can take in a variety of performances from concerts to plays. You can also enjoy a large indoor waterpark with the Great Wolf Lodge Resort. Across the Missouri border sports fans can watch the Royals play MLB games & the Chiefs play NFL games. There are several private, public, secondary, and universities located all over this city. The Kansas City Kansas Public School District is a large public school system that serves the majority of the city. People can also attend the University of Kansas Medical Center or one of the several community colleges around the city including the Kansas City Kansas Community College. Kansas City has a few large companies that make up a major part of the economic sector. The medical community is very large, and two of the top employers are medical-based. Manufacturing is another big part of the economy. The biggest employer is the University of Kansas Hosptial with over 5,000 employees. The second-largest employer is the University of Kansas Medical Center with over 4,000 people. Finally, the third-largest employer is the General Motors company, and they have between 3,000 and 4,000 employees. Despite all of these large employers, Kansas City has an unemployment rate that is slightly higher than the national average. However, job opportunities and the economy, in general, has grown by 1.5% in the past year. It is projected to continue growing for the next ten years and add over 30% more jobs to help stabilize the economy. The Kansas City median housing market price is $83,200, and this puts it below the national average. This price has risen in the past year by over 11%, and the price per square foot is $93. In the coming year, these prices are projected to rise another 5%. These prices are both lower than the Kansas City Metropolitan area because their prices are $225,000 with a price per square foot of $129. The fourth-largest city in Kansas is the city of Olathe with a population of 135,473 people. This population puts Olathe as the fourth-largest city in the Kansas City Metro area, and it also puts it as the 193rd most populous city in the United States. You'll find several large commercial and industrial parks throughout this city, and these parks are major economic support systems. Additionally, there is a large Air Route Traffic Control tower in this city. The Johnson County Executive Airport is also located here, and this helps to bring thousands of tourists through this city each year. All of these small pieces help to create a strong economy year round. Olathe is located in a humid continental climate, and this is classified mild to cold winters and hot summers. The summer months are hottest from June through September with temperatures reaching the mid-70s. Winter's coldest months are December through February, and temperatures usually stay around the low-30s. Spring usually brings wet weather, mild temperatures, and storms. The Ensor Park and Museum bring people year round, and it is a dairy farm and history museum. This particular museum is also a National Historic Site. Additionally, you can visit the Deaf Cultural Center, and this is the only public and independently owned museum pertaining to Deaf culture, art, and history. Finally, the Ernie Miller Nature Center is another place tourists and residents like to visit all year. Olathe has a few larger school districts that run throughout the city including the Blue Valley School District. There are over 26,000 students enrolled in the various public school systems. Students can also attend the MidAmerica Nazarene University or the Kansas State School for the Deaf. The largest employer in Olathe is education based, and it is the Olathe Unified School District with over 4,500 employees. GARMIN International claims the second-largest employer spot with 2,750 employees. Finally, the employer that rounds out the top three employers in the state of Kansas is Farmers Insurance with over 2,500 employees. Olathe's economy is strong with the several large employers boosting it up. The unemployment rate is below the national average, and there was over a 1% increase in job growth in the past year. In the next ten years, Olathe plans to increase local jobs by over 35%. The local median home price for this area is $235,300, and this represents an increase of 9.2% over the past year. The median price per square foot is $146, and both of these prices are set to go up another 4.2% in the coming year. These prices are slightly higher than the Kansas City Metro area's median housing price of $225,000. Topeka is the fifth-largest city and the capital of the state of Kansas. As of 2016, it had a population of 126,808 people. Topeka serves as the seat of Shawnee County, and it is part of the larger Topeka Metro area. The population of the Metro area is slightly higher with a population of 233,068 people. As this city is the capital, the economy relies heavily on the State itself to keep the economy healthy. Around one in five people are employed by the government in Topeka. The education, social services, and healthcare industry make up three additional large sectors of the economy. The retail sector is also important, and around 10% of the population is employed in this field. Topeka experiences fluctuating weather, sometimes more than once a day. This is largely contributed to the fact that this city lies between two different climate zones. The humid continental climate zone and the humid subtropic climate zone both have a great influence on the local climate. You typically see hot, humid summers and cool, dry winters. Additionally, the city receives a lot of rain in the spring and summer months that tapers off in the fall. Topeka's rich history is showcased all over the city, and there are a lot of historical sites to visit throughout the year. You can tour the Combat Air Museum, or you can watch a drag racing competition at Heartland Park Topeka. There is also the Great Overland Station and several sport-based parks to visit. There are four large public school districts that serve the city with several elementary, middle, and high schools to choose from. Additionally, there is also both public and private schools. For secondary education, students can attend Washburn University or the Baker University School of Nursing. There are also technical collages like the Washburn Institute of Technology. As we stated earlier, the role of this city as the state's capital make the State of Kansas the largest employer with roughly 8,300 employees. The second-largest employer is the healthcare sector of the economy with Stormont Vail Health employing over 6,000 people. The Topeka Unified School District is the third-largest employer, and it has over 3,250 staff members. The local economy is stable and supported by several prominent sectors. The unemployment rate is below the national average, and it had a slight decrease over the past year. Going forward, the economy is expected to become stronger as more jobs are created and made available over the next ten years. The median local home value in Topeka is hovering right around $98,600, and this represents an increase of over 3% in the past year. The price per square foot is around $80, and both of these prices are supposed to rise another 3.1% over the next year. The Topeka Metro area's median local home value is currently around $104,000 with a price per square foot of $80. The sixth-largest city in Kansas is the city of Lawrence with a population of 95,358 as of 2016. 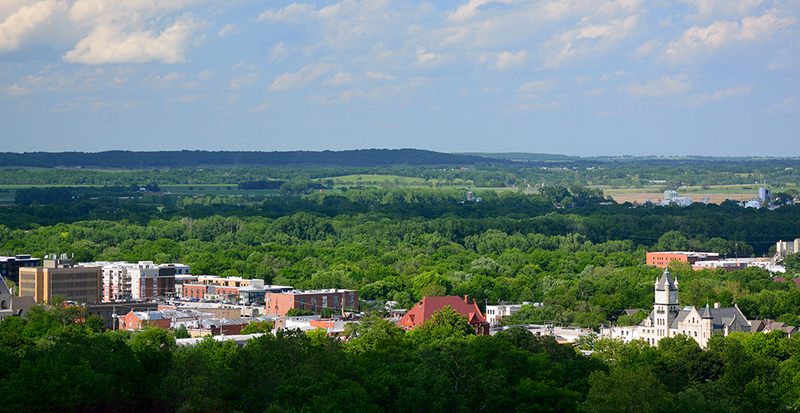 Lawrence is part of the larger Lawrence Metro area, and the combined population is around 119,440 people. This city is largely a college town, home to the University of Kansas and Haskell Indian Nations University. Given the youthful demographics of the town, there is a thriving music and art scene with its own 4-day music festival - the Wakarusa Music and Camping Festival - held every June just outside the town limits. Lawrence enjoys a very diverse economy with several contributing industries making up the economy as a whole. The main sectors are educations, agriculture, industrial, finance, and government. It is also good to note that a lot of these sectors come from the university that is prominent in this town. People who live or visit Lawrence experience a humid continental climate that is characterized by hot, humid summers and cold, dry winters. December and January are traditionally the coldest months of the year with temperatures averaging around the lower-30s. June through August are the summer months, and the temperatures stay in the mid to upper 80s. Additionally, Lawrence sees a lot of rainfall in the early summer and spring months. You'll find a thriving music and art scene that runs throughout the city. Lawrence has been named as one of the best small college towns in the nation. There are many bands, record labels, and artists found here as well. You'll be able to attend several music festivals including the Lawrence Busker Festival. There are also several parks and recreational activities to experience including camping at Clinton State Park. The Unified School District 497 is one of Lawrence's biggest public school systems and it has over 14 elementary schools, four middle schools, and two high schools. 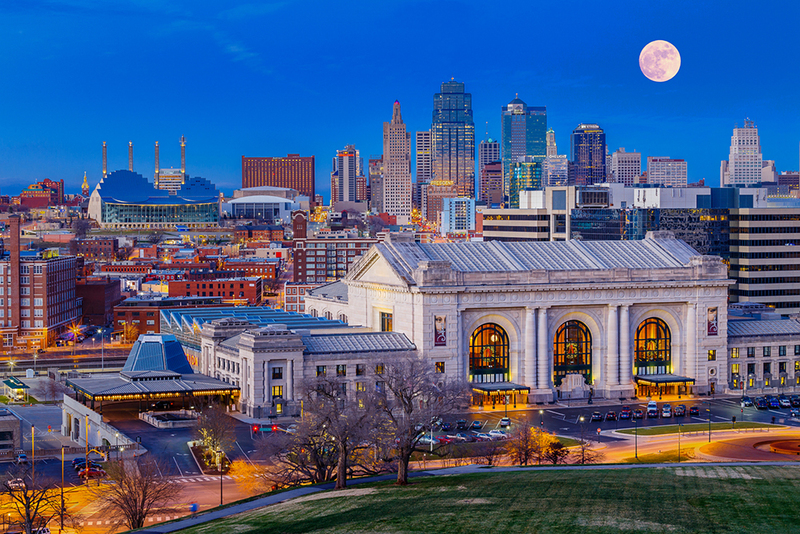 The University of Kansas calls this city home, and it is the city's largest employer. Students can also attend Haskell Indian Nations University. The biggest employer in Lawrence is the University of Kansas with over 9,800 staff members. The second-largest employer in the city is the Unified School District 497 with 1,800 employees. Finally, the third-largest employer in Lawrence is the City of Lawrence with 1,450 employees. The local economy is strong, and the unemployment rate is below the national average. There has also been recent job growth throughout the city, and this trend is projected to continue over the next ten years with over 30% more jobs being created. Currently, the local median home prices are right around $183,100 with a price per square foot of $137. These numbers represent an increase of 7.8% over the past year, and they are supposed to keep increasing another 4.2% in the coming year. The Lawrence Metro has a median home price of $181,900 with a price per square foot of $134. These rates have increased by 7% in the last year, and they're looking to increase by another 3% in the coming year. As of July 1, 2016 the state of Kansas has an estimated population of 2,907,289 across 81,758.72 mi² yielding a population density of 35.56 people per mi² across the state. Several different types of home loans are available in the Sunflower State. Fixed-rate loans are very common, and the terms include thirty, twenty, fifteen, and ten years. The longer the life of the mortgage, the lower the monthly payment will be, which is why the 30-year loan is the most popular. The downside of this, however, is that the APR is higher compared to shorter-term loans. The difference can be as large as a full percentage point. A few lenders in the Sunflower State offer interest-only loans, but usually only for periods of three years. These are mortgages where payments are applied only to interest for a period of time. The loan's principal isn't paid down, so the monthly payments are very low. The low monthly payments only lasts a few years, however. Typically, it's about three years. After this period, monthly payments spike because the loan's principal hasn't been reduced & the remainder of the loan must be paid off in a compressed period of time. For example, on a 3 year IO 30-year loan, the first 3 years are interest only payments, then the loan principal must be paid in full in the subsequent 27 years. The Kansas Housing Authority has programs available to help people purchase their homes. You may be eligible for down payment assistance, closing costs assistance, or they might help you secure a lower interest rate. This program is run by the Kansas Housing Resources Corporation, and it allows first time home buyers to get help with their down payment costs. Any potential applicants will have to fit into the household income requirements, and certain counties are not eligible for this program. If a potential applicant meets these requirements, they can apply for a soft loan to help cover the cost of their down payment. As long as the applicant makes their payments on time, this loan will gradually be forgiven. The amount of the loan can be anywhere from 15 to 20% of the home's original purchase price. Additionally, borrowers are required to make at least a 2% investment in the home's purchase price. The income and purchase limits do vary depending on which county in Kansas you live in, so it is very important to talk to your local lender to see if you're eligible before you start the application process. This is a statewide program as well. Many cities and counties also offer local incentive programs, so be sure to research at the city & county level as well. Kansas has above average property tax rates, with a median assessment of 1.47% in 2016. Each year, residents can expect to pay around the median property tax range of $2,532. These rates do fluctuate by county, and Johnson County collects the most taxes each year at around $2,664.00 per property. The national average assessment for single family homes was $3,313 in 2016, for an effective rate of 1.24%. Kansas is a state that allows adverse possession on a property, however the court system doesn't make it easy. The concept of adverse possession has been used for decades. Basically, a stranger or a trespasser can gain legal control over a piece of property that was owned by someone else. Kansas courts operate on the assumption that any trespasser who occupies a piece of land does so with the land owner's knowledge and consent. It is entirely up to the trespasser to prove this theory wrong in court so they can be granted the property deed. For example, if two neighbors live side by side and one neighbor builds a shed on their neighbor's property and uses it over a 15-year span. The neighbor whose land it is knows about the shed but doesn't say anything. After the 15-year mark is up, the neighbor who built the shed can go to court to claim adverse possession of the land the shed is on. If they win, they get all legal rights to the property. Should a homeowner be unable to make their mortgage payments, the lender has the right to foreclose the home and take possession of it for the purpose of reselling it to another buyer. In Kansas, the lender may foreclose on a mortgage after 120 days by using the Judicial Foreclosure Process. The lender files a lawsuit and obtains a court order. Once the court order to foreclose has been obtained, the lender must list the sale of the once a week for three weeks. The auction must then take place no less than 7 days after the final listing. Even though the new buyer will receive a deed on the property, the original owner who defaulted on the mortgage still has 12 months from the date of foreclosure in which to reclaim and redeem the property. If you are a buyer, you can often pick up a foreclosed property at 20% less than the market listing rate. Foreclosed properties are generally sold "as-is", with no repairs being done by the lender before auction. In the state of Kansas, mortgage lenders go through the court system and do judicial foreclosures. It is also considered to be a recourse state, and this means that the mortgage lender can take the defaulted borrower to court if the property sold at an auction for less than the original mortgage was worth. For example, if the property sold either at an auction or at a short sale for $60,000 and the homeowner owed $100,000 on the original mortgage, there would be a deficiency of $40,000. This $40,000 is what the mortgage lender could take the defaulted borrower to court to try and get. Check out the following resources to learn more about the Kansas real estate market.